I don't know Wayne Tinkle, have never met the man. But based on hearing him speak and watching him on the sidelines, I have to imagine he is getting very frustrated with the inconsistency of the Grizzlies this season. After beating Long Beach State, they collapsed at the end of the game in a 65-62 loss to San Francisco. The Grizzlies trailed by 6 at the half, but came out strong in the second half. They led 59-53 after an Art Steward layup with 4 minutes remaining, but the Dons went on a 12-3 run to end the game, stunning the home crowd. San Francisco got some huge plays down the stretch, and there were three that really were the difference. First, with Montana up 62-59, San Fran sophomore PG Cody Doolin hit an open three with 1:40 to play. On the ensuing possession, with the shot clock winding down, Doolin simply beat Shawn Stockton off the dribble, hitting a shot in the lane to put the Dons up. The last big play... after a timeout, the Grizzlies gave the ball to Will Cherry to take to the lane, and it looked like he was going to get an easy layup for the tie. Suddenly, the Dons big man Cole Dickserson came from the weak side for a huge block, and that was essentially the game. Montana got a desparation three-point attempt from Derek Selvig as time expired, but it wasn't even close. 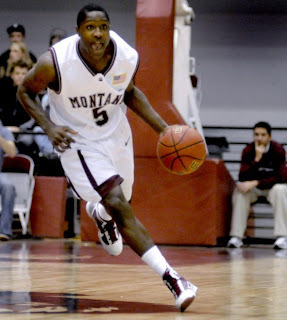 For Montana, senior Art Steward was the star, notching a double-double with 17 and 10. Other than him, the big guns struggled. Will Cherry had 5 points and 3 assists, Kareem Jamar had 12 points, and Derek Selvig had 6 points. Montana needs 40 points per game from these guys. Montana will not have time to sit and sulk about this one, as they travel to Oregon State for a game on Sunday. They have the team capable of winning that game. However, they need to be more assertive offensively, and their stars need to make plays. If not, there will be a lot more nights like this one.